They will do everything possible not to look ahead. Not to focus on tomorrow before they’ve conquered today. That’s because Middleton’s girls swimming and diving team knows that staying in the here and now will take them exactly where they want to go come November. The Cardinals have won back-to-back WIAA Division 1 state championships — the first titles in school history. With the overwhelming majority of state contributors returning in 2018, Middleton will be the favorite to make it a three-peat this season. But Middleton coach Lauren Cabalka and her Cardinals fully intend to enjoy every stroke of the journey. So while everyone else may already be putting a third gold ball in Middleton’s trophy case, Cabalka isn’t one of them. “We absolutely have some incredible talent on our team, as well as some hidden gems waiting to emerge,” Cabalka said. “That's what makes this such an exciting year. We have never been a team who focuses on the postseason before the season has even begun and we're not going to start now. Make no mistake about it, though, these Cardinals have talent up and down the pool. Middleton brings back six individuals that were key cogs on last year’s state title team and has several others ready to make their mark. Junior Gabriela Pierobon Mays won her second straight state championship in the 100-yard butterfly last November. Pierobon Mays also was a member of Middleton’s state championship 200-medley relay team and finished third at state in the 100-yard butterfly. Pierobon Mays is returning from an injury. But Cabalka said she’s back to full strength and ready for a terrific year. “Gabby is coming off of a significant injury, but is back with a vengeance,” Cabalka said. “I have never known a more determined athlete in all of my years of coaching. Senior Hannah Aegerter was part of Middleton’s state championship 200-yard freestyle relay team and finished fourth in the 200 freestyle. Aegerter also competes in the 200 IM and the 500 freestyle. Senior Cora Mack finished sixth at state in the 50-yard freestyle and sixth in the 100-yard freestyle. Mack was also part of Middleton’s state championship 200-yard freestyle relay team. “Cora is our sprint specialist,” Cabalka said. “If we lack in an area, this is it, but Cora makes sure that we are still well represented at invites and at the state level. Senior Emily Keebler was sixth at state in the 200 individual medley and also competes in the 100-yard backstroke. “Emily had a breakout season last year,” Cabalka said. “We always knew she had it in her, but she finally believed it and unleashed her talent throughout the season. Junior Alex Anagnostopoulos finished fifth in the 100 breaststroke at state and also swims the 200 IM. “Alex is one of the hardest working, most determined swimmers I have ever coached,” Cabalka said. “She is constantly reflecting on how she can improve and working hard to get better. Sophomore Ally Silvestri finished third in the 100-yard breaststroke at state and was a member of Middleton’s state championship 200-yard medley relay team. “Ally was a highly anticipated freshman last year, with a lot of hype to live up to,” Cabalka said. “She more than delivered and has been an absolute dream to coach. 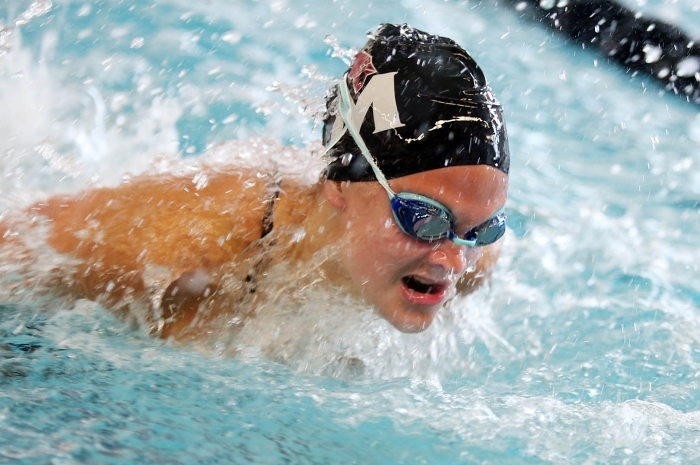 In addition to Middleton’s gifted returnees, it expects to receive immediate contributions from freshmen Amanda George (distance freestyle), Molly Haag (distance freestyle, butterfly) and Ella Needham (freestyle, backstroke). Cabalka knows, though, there aren’t many gaps. And in many places, complacency could rear its ugly head. But Cabalka — a former MHS standout who has taken the program to unprecedented heights — makes sure that self-satisfaction stays out of her pool. Instead, Middleton knows that its success from the last two years hasn’t earned it any points in 2018. And that attitude could lead to terrific results again this season. “From day one, we've operated under the ‘back to business as usual’ mindset,” Cabalka said. “2016 and 2017 were special years, no doubt, but they are in the past. We need to stay grounded as a team and have a solid understanding of who we are from the very start, so we do not get ahead of ourselves or allow outside pressure to weigh us down.